Norman Granz records Charlie Parker with Strings. | Bob's Jazz Blog. Norman Granz records Charlie Parker with Strings. While Norman Granz successfully grew his JATP business he also did very well as a record producer. He was not afraid of putting money in projects which were questionable in as much they would be commercially a hit. In 1956 he founded Verve records in which he folded his earlier founded Clef, Norgran and Down Home labels. Verve would become one of the most successful independent jazzlabels. 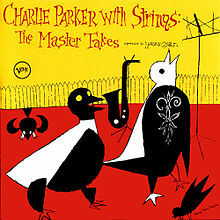 The Charlie Parker with Strings project was a controversial project. Granz later said he talked Charlie Parker into doing it whereas Parker said he had already wanted to do this way back in the forties and that Granz finally let him do it and put up the money. The album was praised and critizised but everybody seems in agreement that “Just Friends“ is a great version by Charlie Parker with Ray Brown and Buddy Rich in the rythm section. « Addis Acoustic Project: Yefikir Migib.